The Honeywell Analytics Series 3000 range of transmitters provide comprehensive monitoring of toxic and Oxygen gas hazards in potentially explosive atmospheres. Suitable for mounting both indoors and out, they are available in two versions and offer excellent versatility. 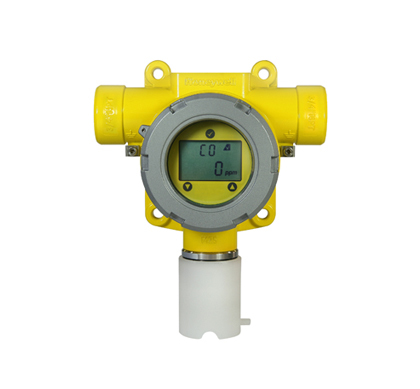 The MkII is contained in a flameproof housing, has an intrinsically safe sensor connection and is for use in predominantly Zone 1 applications. However with the use of the optional remote mounting kit the sensor of the MkII can be mounted in a Zone 0 environment. The MkIII is for use with a separate suitable IS barrier allowing the complete transmitter to be used in Zone 0 applications. These low powered gas detectors all feature a loop powered 4-20 mA connection, making them ideal for both new and retrofit installations. Users can configure the detector through the use of the easy to read LCD and intuitive interface while fault diagnostic software and a programmable calibration period greatly simplify maintenance procedures. The intrinsically safe smart sensors are supplied pre-configured and can be "hot swapped" without having to remove power to the detector, saving time and money during commissioning and routine servicing. A remote sensor mounting kit is available that allows the sensor to be mounted up to 15m (50ft) from the transmitter, making it ideal for operation in areas that are difficult to access. Series 3000 is supplied with all necessary accessories for easy installation. The detector can be wall mounted using the integral mounting lugs or pipe mounted (horizontal or vertical) using the optional pipe mounting kit. Electrical installation is made using the 2 x M20 cable entries (ATEX/IECEx version) or 2 x ¾"NPT conduit entries (UL/c-UL versions). A suitable blanking plug is also supplied to seal any unused entries. A weatherproof cap is also included for use in the harshest outdoor conditions.